Hard, uneven ground can pose a problem for horses’ hooves – whether it be rock, gravel or even packed dirt. One problem in particular is sole bruising, which can occur any time a horse’s feet comes in contact with tough surfaces. Since horse owners may not be able to see bruising until after the healing process has already begun, it’s important for owners to be mindful of their horses’ stomping grounds and provide the proper support to avoid injuries or discomfort. Discomfort – If a horse is visibly uncomfortable when walking, it could be a sign that the horse’s feet are bruised. For example, horses may walk hesitantly, at a slower pace or steer clear of anything hard and instead find soft spots. Over Trimming – Over trimming increases susceptibility to bruising. 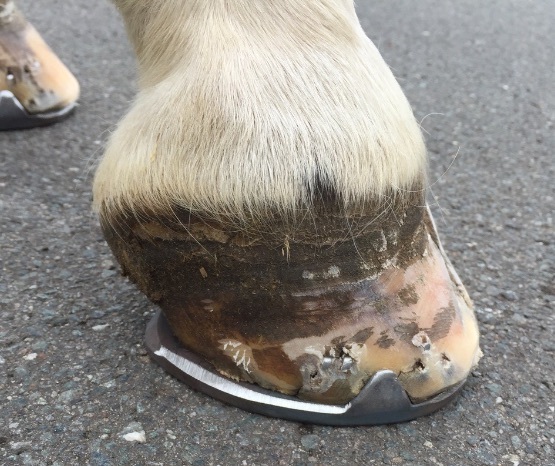 If horse owners trim the feet too short, it’s important to provide horses with the proper support to keep the horse’s vulnerable feet from bruising. Age – Horse owners with more senior horses may need to err on the side of caution when it comes to bruising. As horses get older, the soles become flatter, and thus are more prone to bruising than younger horses. If an older horse seems especially uncomfortable, it could be a sign that it is suffering from sole bruising.